I know it's already spring, but porridge is not really just for the cold weather, right? It's way up there in the list with the title "comfort food". 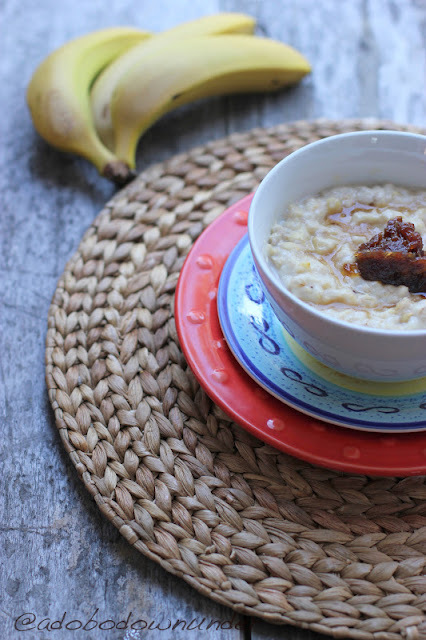 Any version whether its the Chinese congee or the Filipino lugaw, a good porridge brings us back there - sitting on your grandmother or grandfather's (or you rmum's or dad's) lap listening to tall tales, folk lore and colourful adventures. Comfort food hugs you tight and gives you warmth. Well, this isn't a recipe passed on to me by family, but the first time I tasted it, it just felt good. It was at a blogger's brunch party at Kazbah in Balmain. One of the 8 dishes served on the day, this one stuck with me. It was served to share, in a massive bowl with some date compote on top. It was simple and yet, that one spoonful was not enough. And then another. There was a nutty taste to the porridge and a certain bite at every mouthful. And we can only guess it's barley. So I've tested and made this up. And this is it. To make this, I had to adjust as I went, tasting and tasting every minute, just to get it right. In a medium sized pot, put together the oats, rice flakes and barley. Add water and bring to a boil. Add the milk and bring to a boil, then reduce heat to a low simmer. Stir occasionally to make sure porridge is not sticking at the bottom of the pot. Add the bananas and continue to simmer (about 20-30 minutes) or until barley is cooked. (You will know when its cooked as they will be soft but still have that bite). If the porridge becomes to thick, just add a quarter cup of milk at a time, stir then taste. Add sugar to suit your taste. But the natural sweetness of the ripe bananas should be fine. In a small pot, pour the verjuice and add the dates. Bring to a boil then slow simmer until the dates have softened and the sauce reduced. Set aside to cool. For a sweeter version of this compote, you can add 1 tablespoon raw sugar to the mixture while simmering. Or you can try Suzanne Husseini's version in her book Modern Flavours of Arabia which I found through Emma's My Darling Lemon Thyme where she used fresh orange and lemons. The date compote was made with verjuice so the natural sweetness of the dates came through. This was unlike the one that topped what we ate at Kazbah (which was sweeter), so hubby was not sold to the compote on top. But he gives two thumbs up to the porridge. Beats any 90 second breakfast oats at any time. Drizzled with some honey (or real maple syrup) and serve. With love and lots of hugs. I grew up eating oatmeal that had been cooked in milk; my dad thought (a 2nd generation Scot) thought it was very good for me... This reminds me of my childhood breakfasts, but sounds so much better! Thanks Alyce! Being Filipino, I am only starting to love this dish. This looks so good. Porridge season is just starting again in England, and it's my staple breakfast during the cold time of year. Is verjuice easy to get in Australia? I often come across it in Australian cookbooks or on blogs, but I do not think it's easily obtainable here in the UK. Thanks Annika! Yes, verjuice is easily available at all supermarkets in Australia. I believe its a unique Australian product made from special grapes in the South Australian region. You can substitute with orange and lemon juice or sweet wine to do the compote.